AMAZING FOOD, HISTORY & CULTURE! Melting Pot Food Tours offers delicious food tasting tours throughout the LA area that will indulge your taste buds and delight your senses! 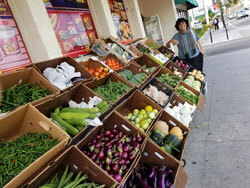 Whether you’re looking to explore the Original Farmers Market and the eclectic Third Street area of mid-city Los Angeles, discover the vibrant past of Old Pasadena, or enjoy a fabulous special guided tour through Thai Town with celebrity Chef Jet Tila, Melting Pot Food Tours will be your guide. Melting Pot Food Tours continues to add new Los Angeles food tours and events, so check back often for LA tour updates. how much people love our culinary tours! choose melting pot Food Tours in los angeles? Enjoy unique culinary cultural delights while supporting our local food artisans! More than just a food tour, Enjoy L.A.'s rich diversity, mouthwatering cuisine, and charming residents. Discover the fascinating history of Los Angeles and what makes this city such a unique place. Enjoy inside stories you won't hear anywhere else! A memorable experience in a small group setting with our entertaining and engaging tour guides. A few of our private tour groups! Our Mission at Melting Pot Food Tours is to entertain and educate locals and visitors alike and ignite in them a passion for and appreciation of Los Angeles as a world-class culinary destination. Moreover, Melting Pot Food Tours strives to create and sustain interest in the culturally rich neighborhoods of greater Los Angeles by highlighting their extraordinary and diverse contributions to the culinary marketplace.